This meeting takes place at your home or an outside venue where your dog is comfortable. 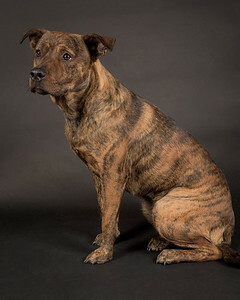 Our goal in this session is to learn as much as we can about your dog’s personality and what makes your dog unique. From this discussion we will learn how to best produce visual products that tell your dog's story and the relationship with you. We also make decisions about the best location of the actual photo session, and begin to form a list of photos to be captured. If we are meeting in your home (best option), we will look and make recommendations for where your large format prints will hang discussing the size and style of framing that will compliment your home’s decor. Photo sessions for our Custom Portraits service are typically about one and a half to two hours long. This time includes any time needed for your pup to settle in. 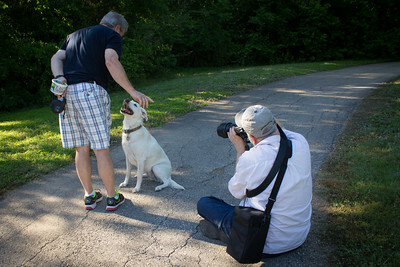 You can bring up to three dogs to your photo session and more at $20 per dog. (Dogs must be from your immediate household.) The location of your photo session will be decided based on what we learn at the Design Consultation. You can choose to have your session at our studio where we can do a combination of inside with studio lighting and in our backyard with natural lighting. Or we can do a Location Photo Session. 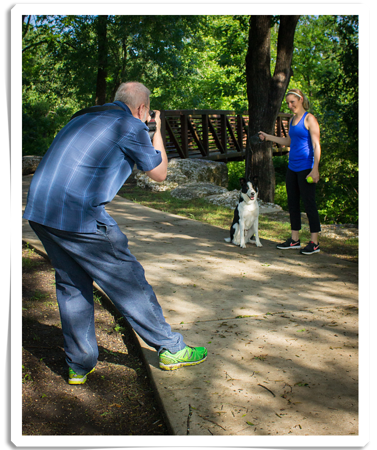 Location sessions can be in your home, your backyard, a park or other location. At the Design Consultation meeting we will help you think about the issues to consider for a successful shoot based on your dog’s personality. We can do location sessions anywhere within a 45 minute drive from our studio. Soon after your photo session, we will schedule a viewing session where we will prepare a slide show of the best images we captured at your photo session. We will show you suggestions for wall portraits, wall collections, storyboards, and albums. This is the time when you make decisions about framing and place your order. After delivery we will schedule a time for you to visit our studio to view and pick up your products. The time we take in post processing and ordering will vary from two to four weeks, depending on the products ordered. Our Most Popular Custom Portrait Service requires a $200 session fee plus the cost of the print products ordered. The session fee includes the time we spend in the design consultation, one and half to two hours of the photo session, the review/order session, and the time we spend in post processing, placing the order and delivery of your products. After adding the cost of selected products you can expect to spend a total of > $500. The $200 session fee is due the day of the design consultation. Texas Sales Tax will be added to all fees.Additional product fees must be paid at the review/order meeting. We can however arrange for a time stretched payment schedule.